Accommodation: Deluxe studio suite at the Roda Metha Suites, Oud Metha Road. Booked on Hotels.com for £533. I’d never quite understood the allure of Dubai. A playground for the rich, with the biggest and best of everything. Glitz and glamour, extravagant cars and endless malls. So hot in the summer months that you can’t spend any time outdoors. The bottomless brunches sounded fun but overall, it all seemed a bit too excessive and expensive to me. However, when I got the opportunity to spend a week there for work, I jumped at the chance. 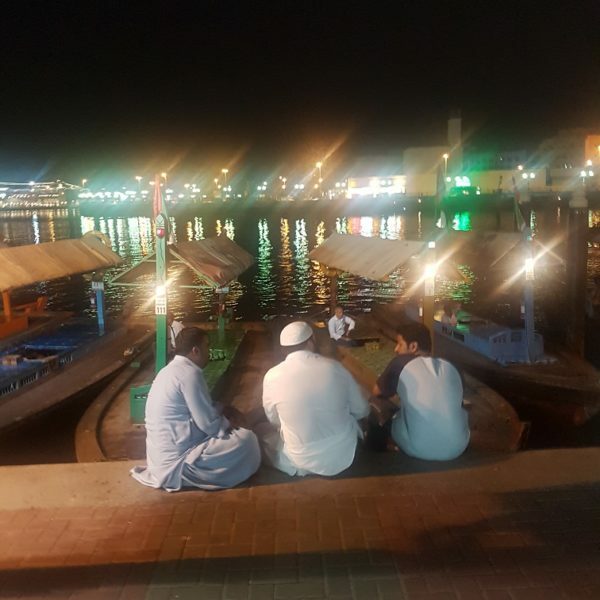 I decided that there must be more to Dubai than the glitz and glamour. I would use my free time to find the ‘real Dubai’! 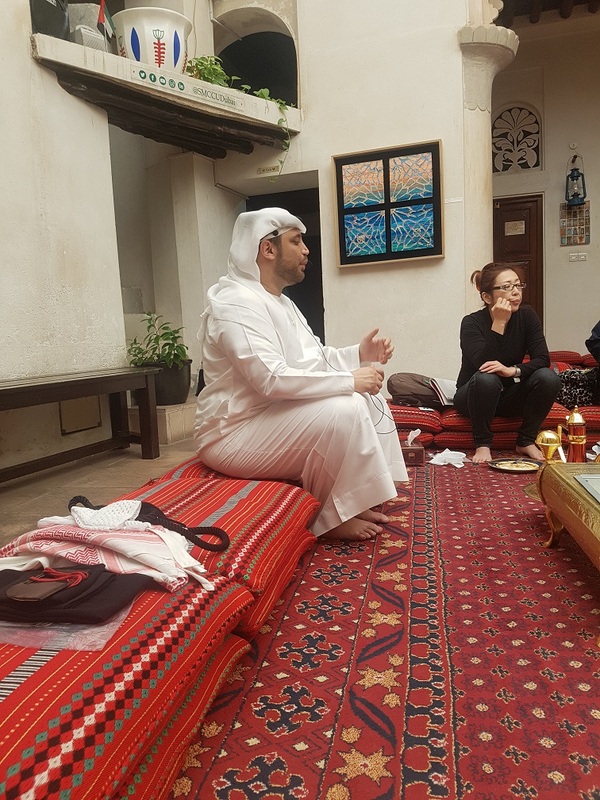 Based in Al Fahidi Historical Neighbourhood, the Sheikh Mohammed Centre for Cultural Understanding holds cultural meals most days of the week. Depending on the day, you can visit the Centre for breakfast, brunch, lunch, afternoon tea or dinner. Weekends in Dubai are Friday and Saturday (starting work on a Sunday had me confused all week!) so I had a Saturday free and started my day with a cultural brunch at 10.30am. 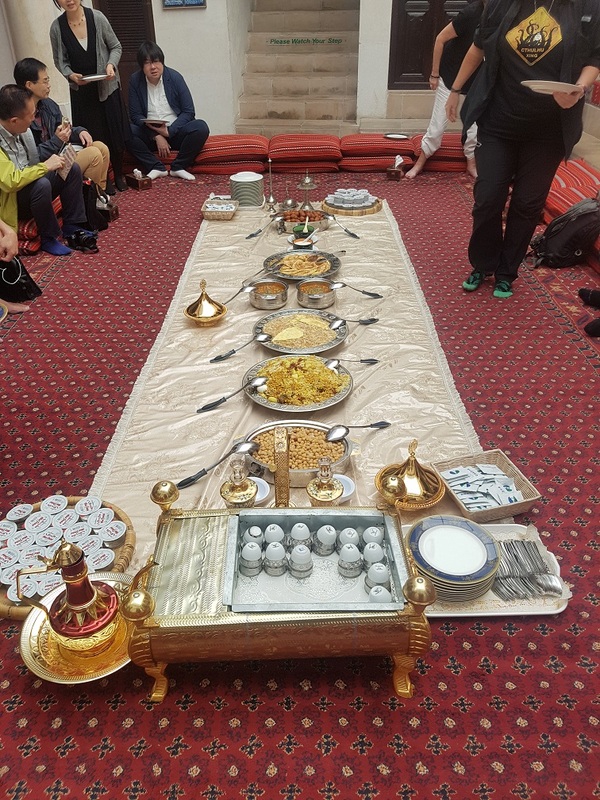 The meal is laid out on the floor within the restored wind tower house, with guests sitting around on Bedouin-style carpets and pillows. The food was delicious and plenty of vege options available. Outfits were discussed – from the men’s Kandura to the women’s hijab and burka. He asked if anyone wanted to try on the women’s outfits and I enthusiastically volunteered! 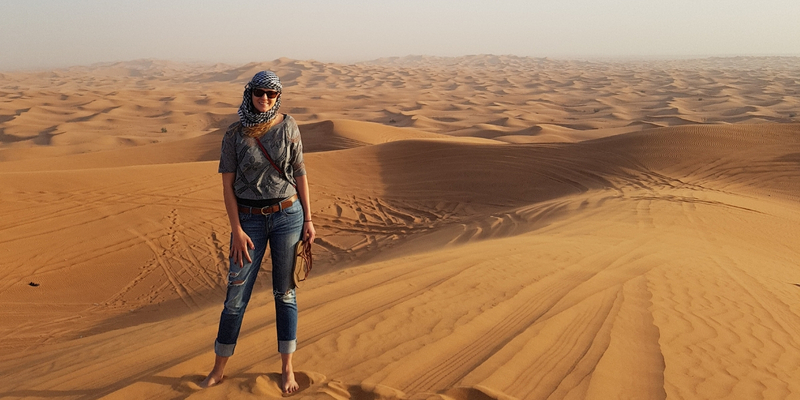 I tried on the various women’s outfits, ending with a burqa (which I definitely won’t be wearing on a daily basis – especially in the Dubai heat). I was fortunate to have just made a few good friends in Malaysia who are Muslim and they are very patient with my many questions about their religion. Many people from ‘the West’ don’t know any Muslims and we are constantly bombarded with negative Muslim stories in the media. 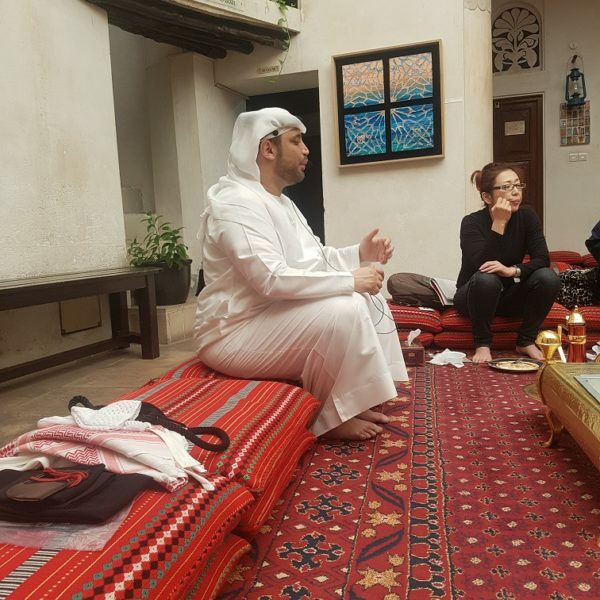 The tagline for the Sheikh Mohammed Centre for Cultural Understanding is ‘Open doors. Open minds’. I love the concept of this and think that they are doing a very good job of building cultural understanding of Emiratis and Islam. 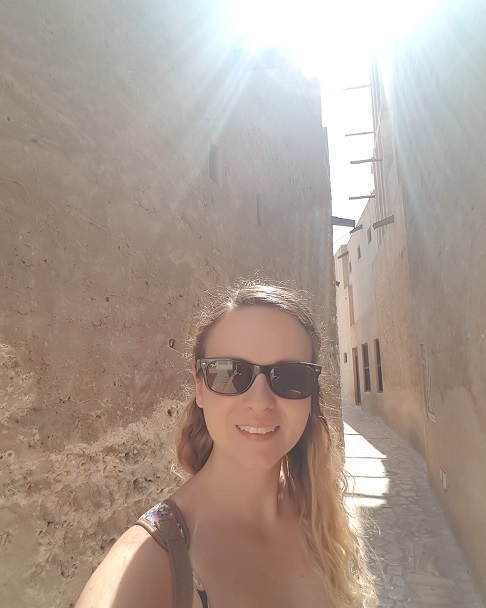 After the brunch, I took a walk around Al Fahidi Historical Neighbourhood, one of Dubai’s oldest communities. 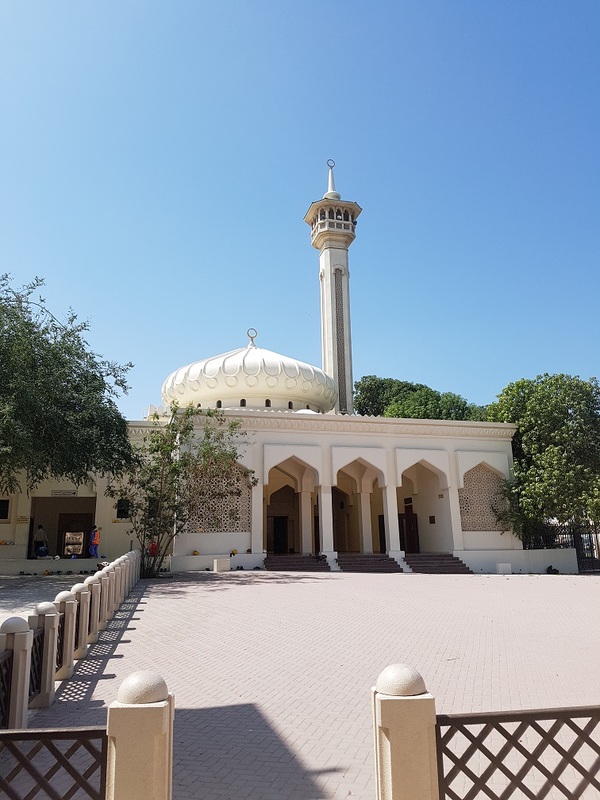 I was walking around the maze of beautiful buildings under the glorious blue skies and could hear the call to prayer from the mosque. 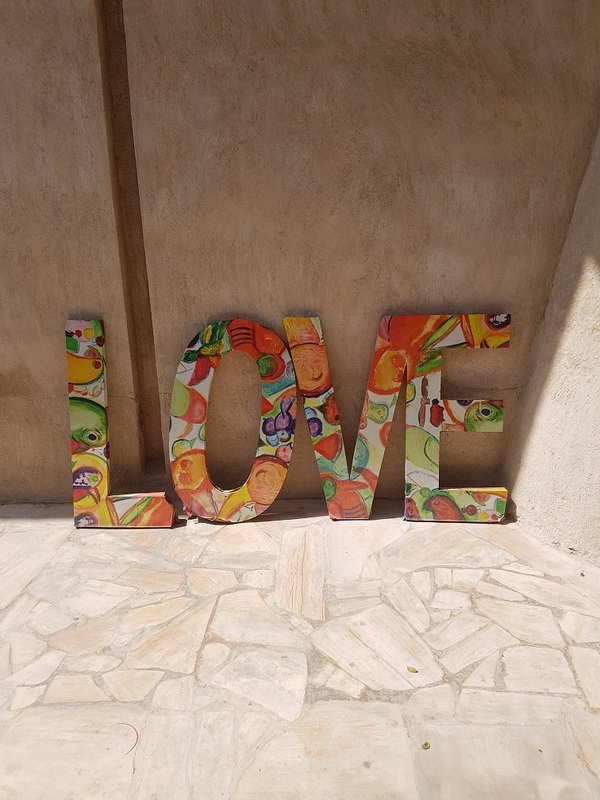 I was at my happiest – exploring a new place, learning about a different culture, in the sunshine. 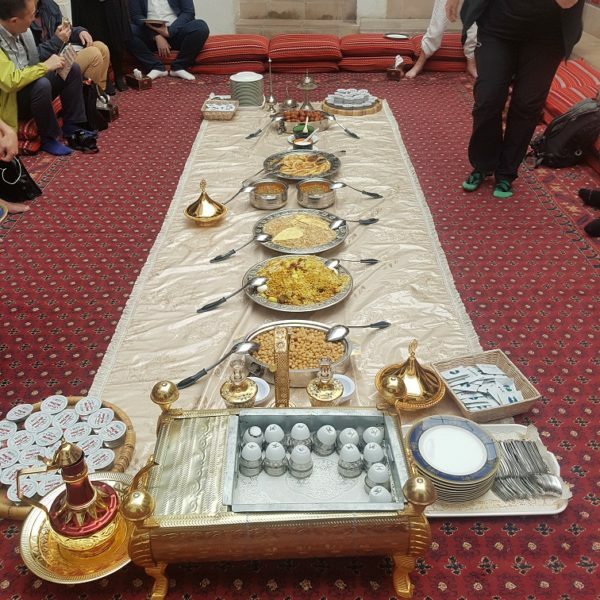 If you are visiting Dubai, I highly recommend visiting the Sheikh Mohammed Centre for Cultural Understanding for one of the meals. 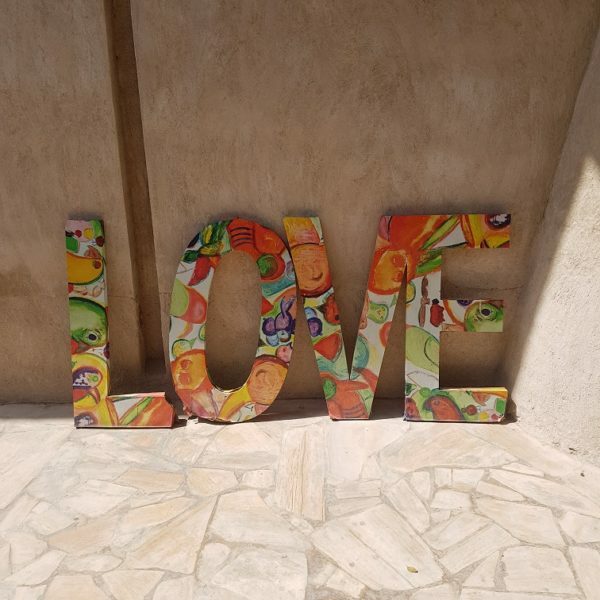 The brunch costs 150 AED per adult and can be booked online in advance. 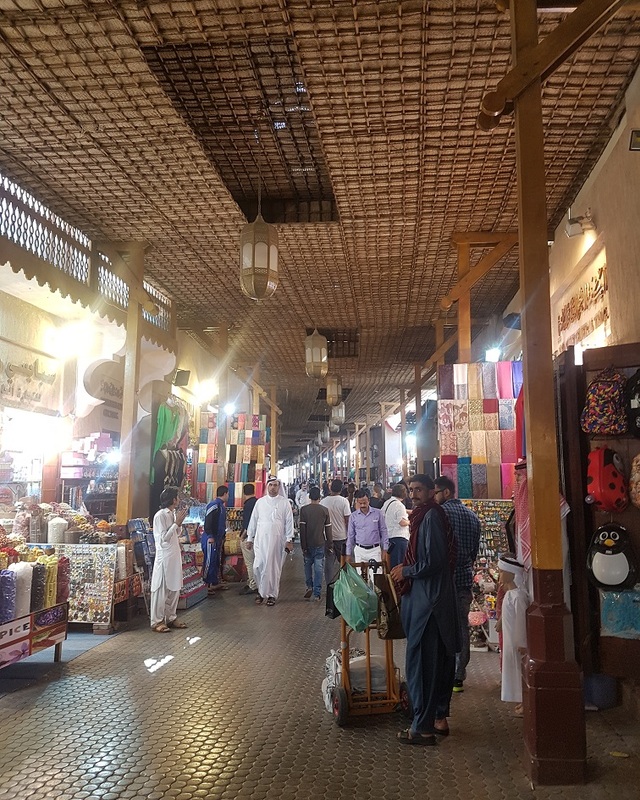 Make sure you set aside some time before or after to take a stroll around Al Fahidi Historical Neighbourhood. 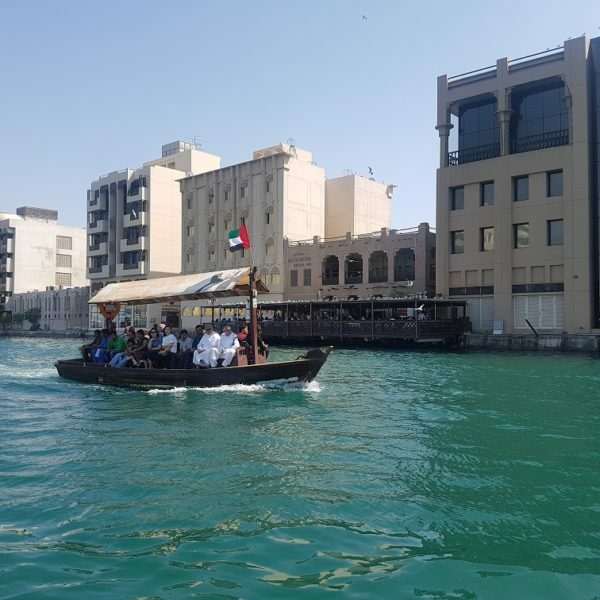 Walk 10 minutes from the Sheikh Mohammed Centre for Cultural Understanding, and you will find the Dubai Museum. 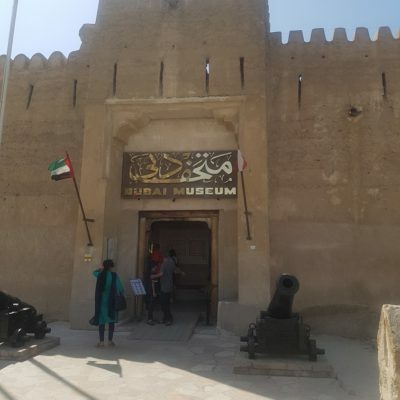 It is located in the Al Fahidi Fort, built in 1787 and is the oldest existing building in Dubai. 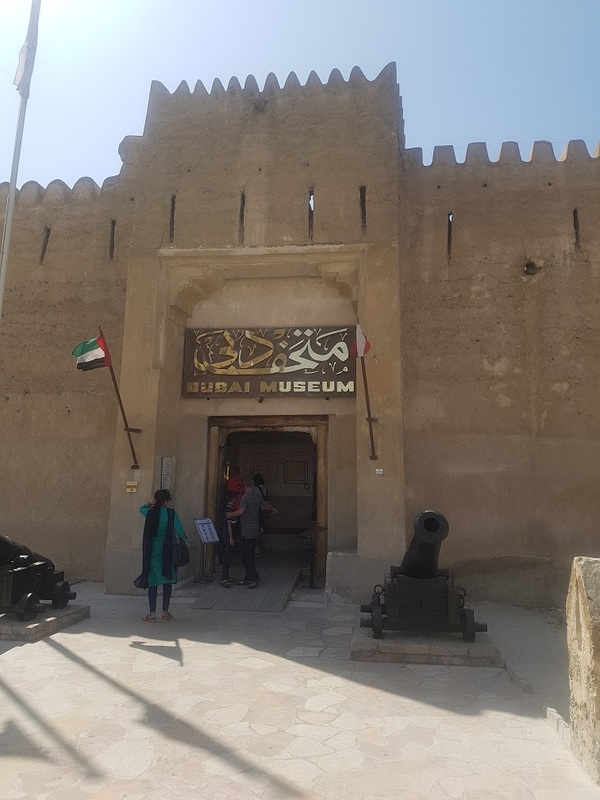 With an entrance fee of only AED 3 (less than £1), I didn’t have high expectations, thinking I would have a quick wander through the museum. I’m not the biggest fan of museums and quickly lose interest reading exhibition descriptions. However, I was pleasantly surprised and ended up spending about an hour and a half wandering around and learning a lot. 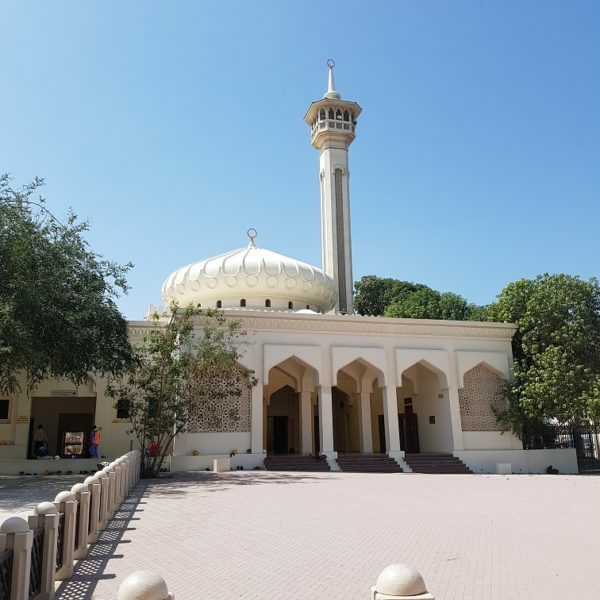 The museum gives a history of Dubai, long before the oil-rich Dubai we know today. 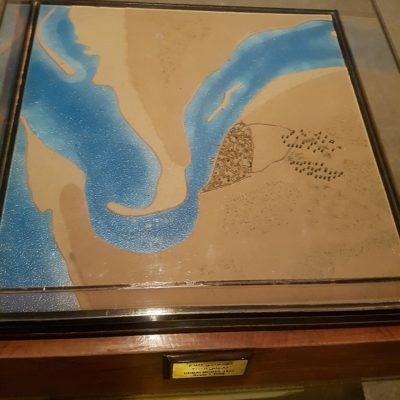 There’s a model of Dubai in 1822, showing little more than the Creek and a few homes. It goes through the decades showing the trades and population increase over the years. In the 1940s, the population of Dubai was only 20,000, growing to over 3 million today. 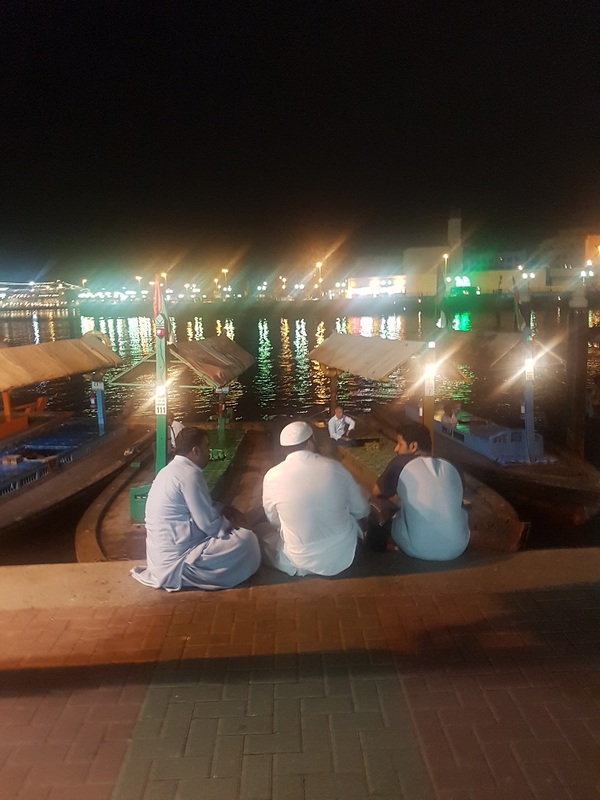 There’s information on how people have lived over the years, including the history of pearl-diving in the region. The Dubai Museum has a number of recreations of houses, souks, etc to show you how life would be over the years. It kept me (and my short museum attention span) amused and I think would be a good place to visit with kids. It doesn’t look very big from the outside, but there’s plenty underground to explore. 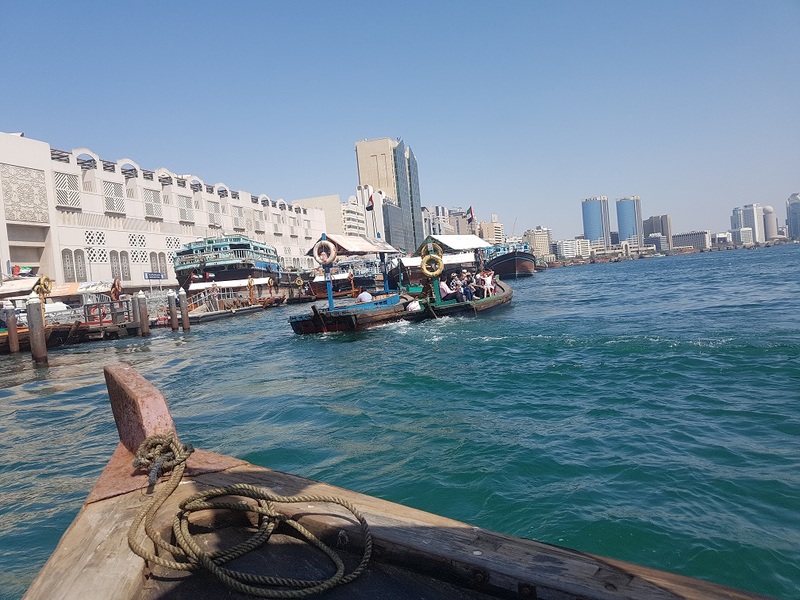 As the website says – ‘The comparison between old and modern Dubai, which are separated by a few number of years, show you the great, continuous efforts that led Dubai to its current state of progress and pioneering’. 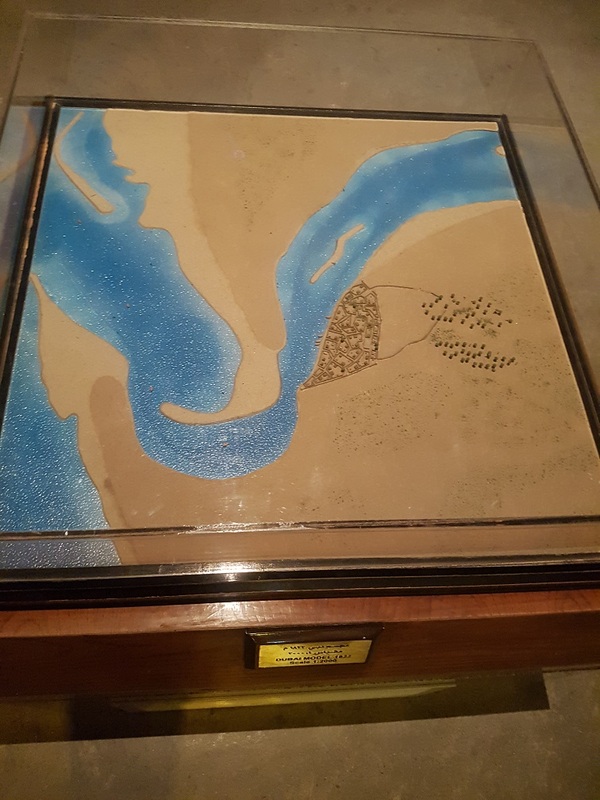 The growth of Dubai in such a short time is phenomenal and the Museum gives you the chance to step back from the massive skyscrapers, into the Emirate’s oldest building and see how and why it has developed so much over the years. The Dubai Museum is open until 8.30pm each day and is a good option for an evening activity, once the sun has set around 6.30pm. 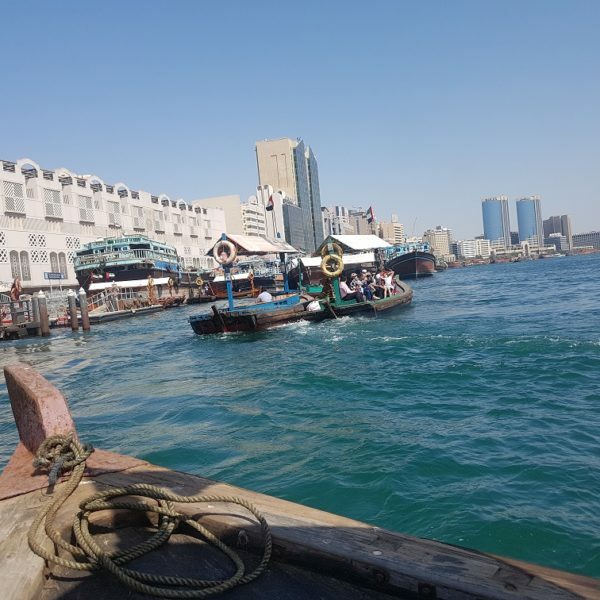 Dubai Creek is a 14km natural inlet that divides Dubai in two – Deira to the northeast and Bur Dubai to the southwest. The locals (and tourists) cross the Creek on traditional style Abras. 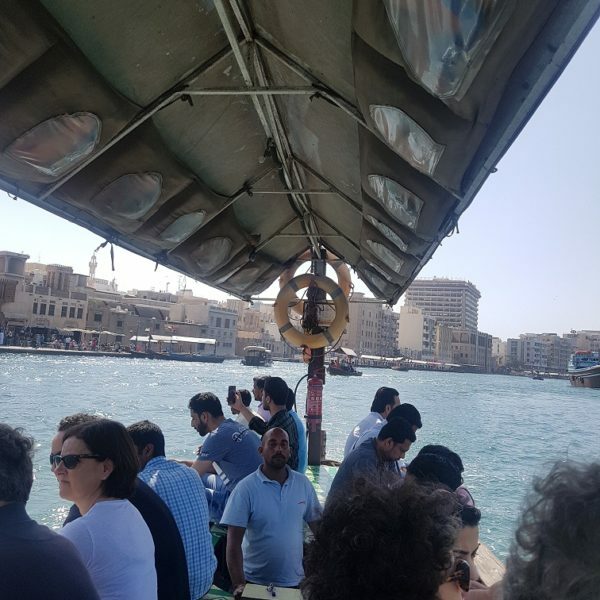 These are small motorised water taxis, with the driver sitting low down in the middle of the boat and passengers around the side. 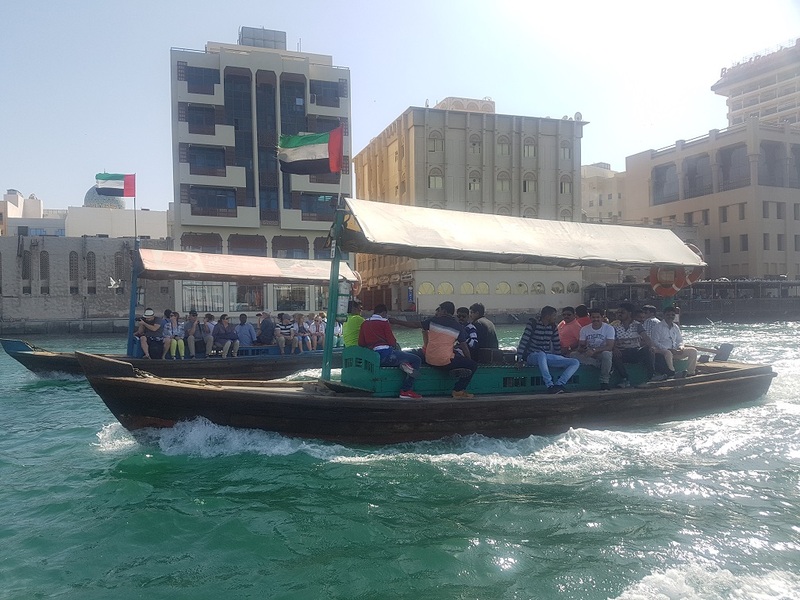 The fare for an Abra ride is only AED 1 so it a very cheap (and quite fun) way to cross the Creek. 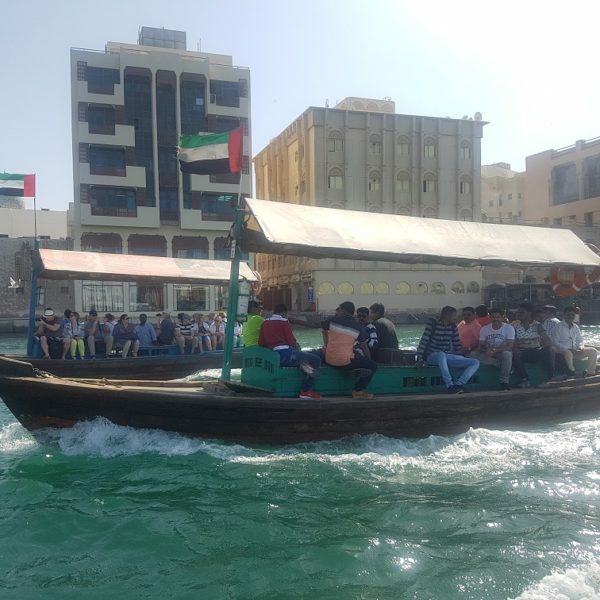 You can also charter an Abra to cruise the Creek for AED 120 an hour. 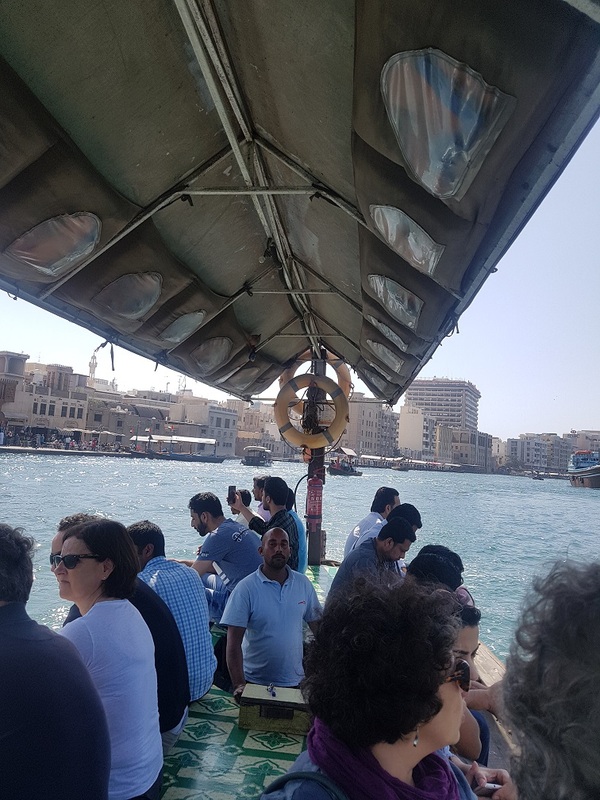 There are two Abra routes – between Bur Dubai Abra Station and Deira Old Souk Abra Station (6am-midnight) and between Dubai Old Souk Station and Al Sabhkha Abra Station (24 hour). There’s around 150 Abras on the Creek. Just jump on, pay the driver and it will leave when there’s about 20 people on board. 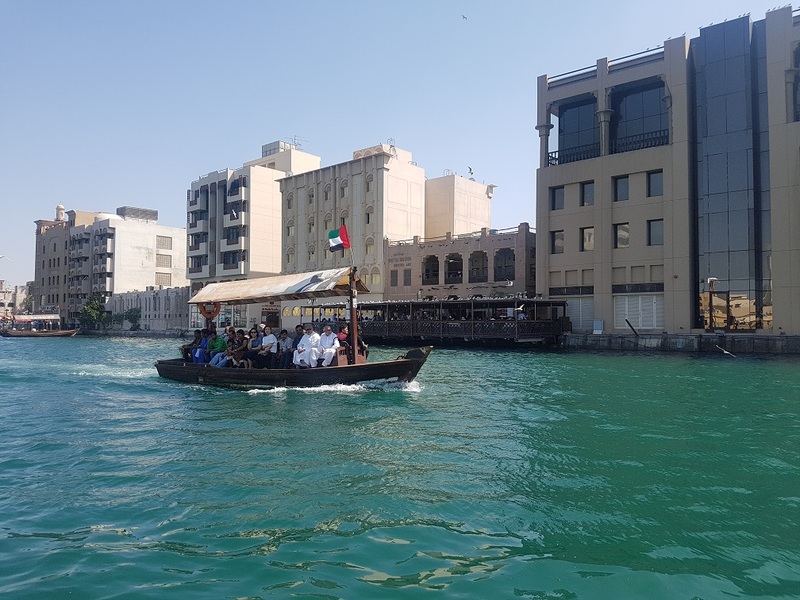 Look out for traditional Middle Eastern architecture at the Bur Dubai side of the Creek and modern skyscrapers to the Deira side. The Dubai transport website has more information about routes. 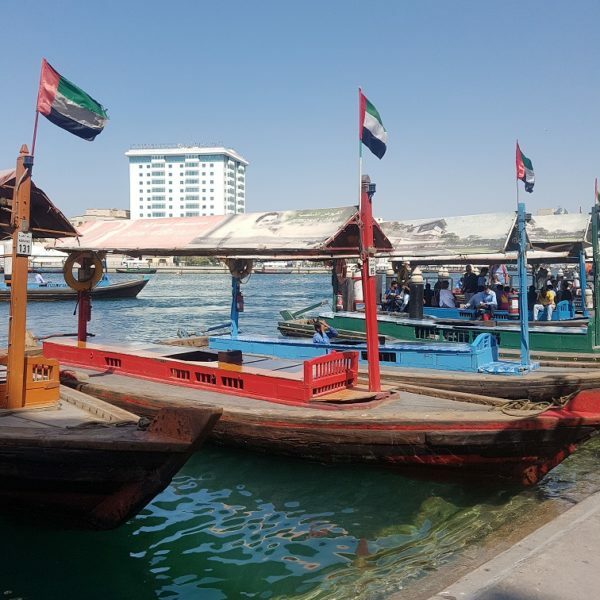 Bur Dubai Abra Station is a seven minute walk from Dubai Museum. 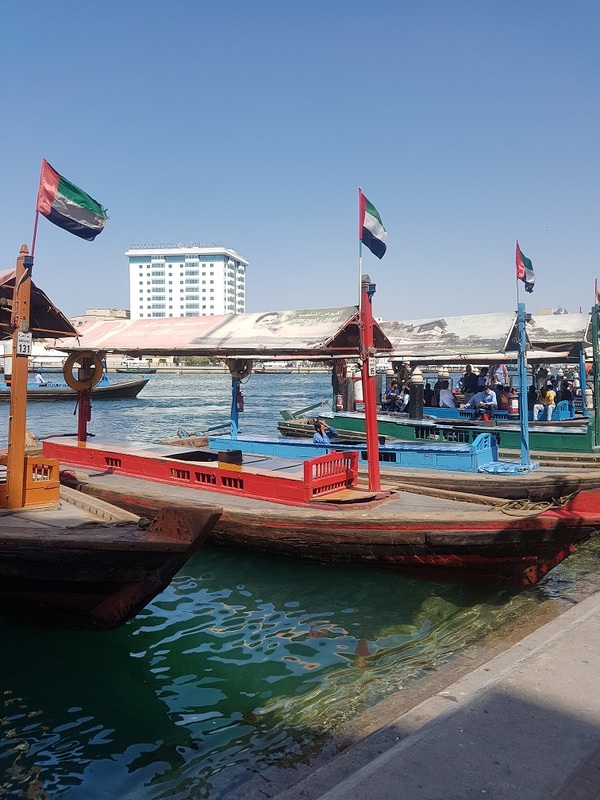 Dubai has various souks including Gold, Spice, Perfume and Textile souks – all located at either side of the Dubai Creek. 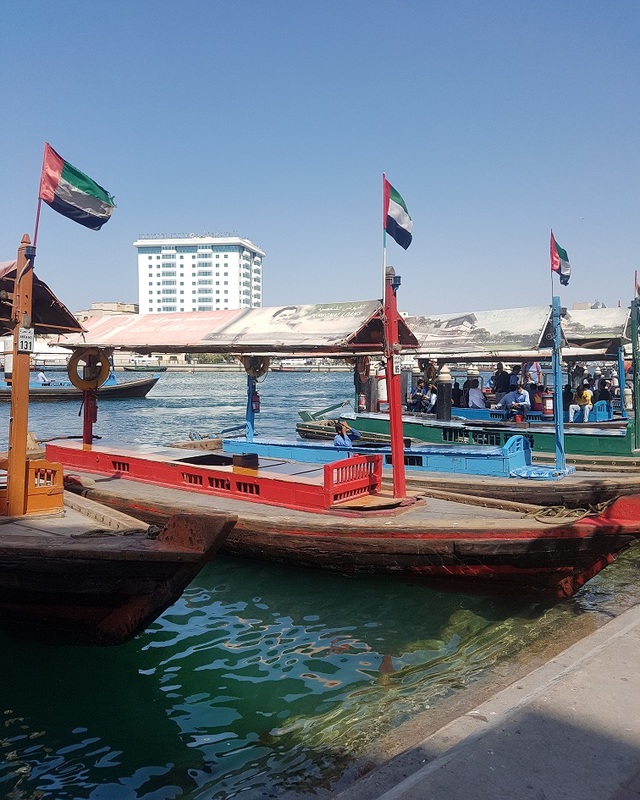 After the Dubai Museum, pass by the Textiles Souk on the Bur Dubai side before catching the Abra to visit the Gold, Spice and Perfume souks on the Deira side. 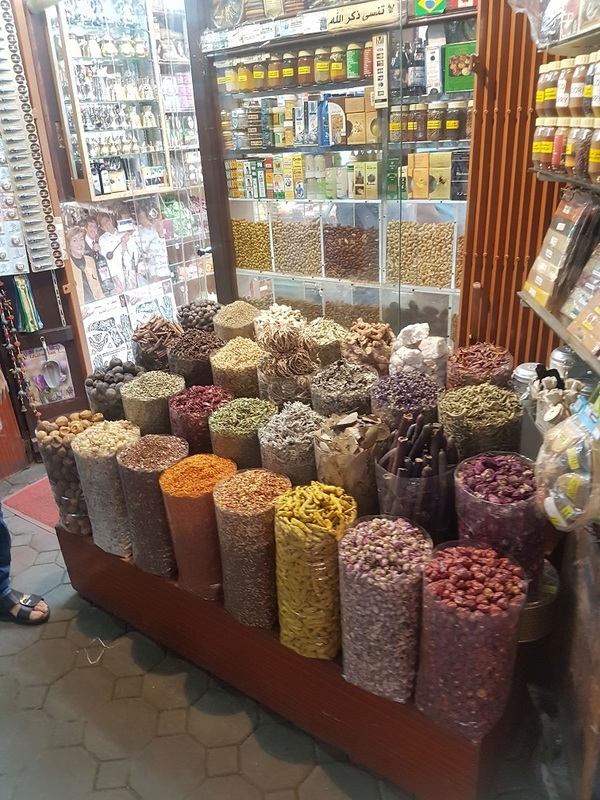 I visited the Textiles Souk (where I loaded up on souvenirs) and the Spice Souk (where I admired the beautiful sights and smells of the spices). 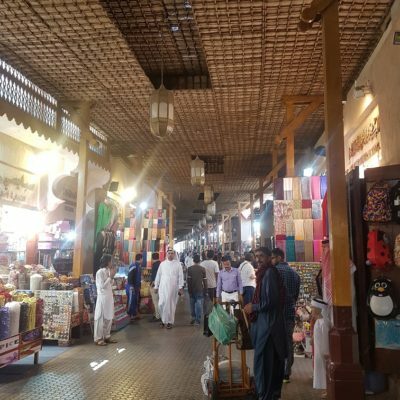 I was on my own when visiting both and felt comfortable chatting to and haggling with the men running the stalls (I guess there’s women too but I only met men there). People were friendly and not too pushy. On more than one occasion, a guy asked me where I was from and I got the reply “UK? I’m ok, you ok?” – this hilarious joke was free of charge. At the Textiles Souk I picked out a pile of souvenirs, from t-shirts to pencil cases and haggled down the price. A woman was buying similar things and the guy was quoting her about double what I had agreed so I encouraged her to barter with them. Don’t be afraid to haggle! 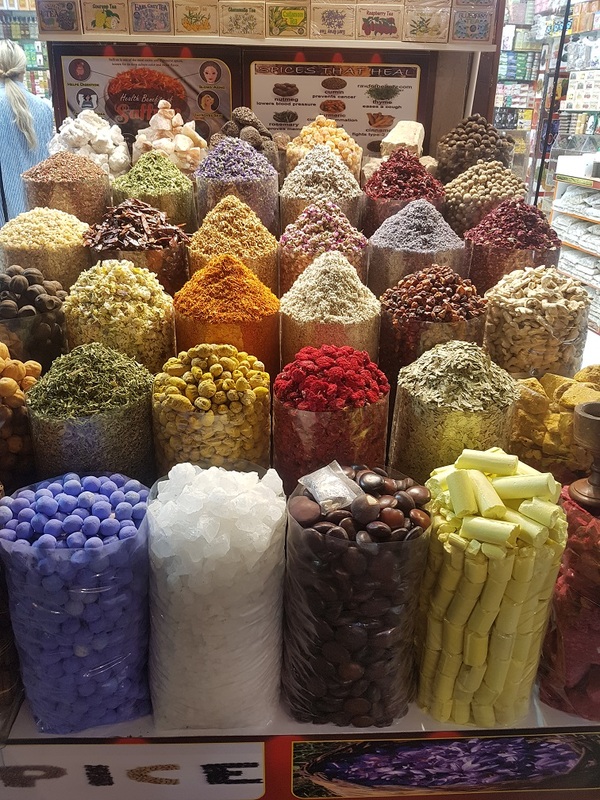 I loved the Spice Souk with colourful piles of spices outside each store. 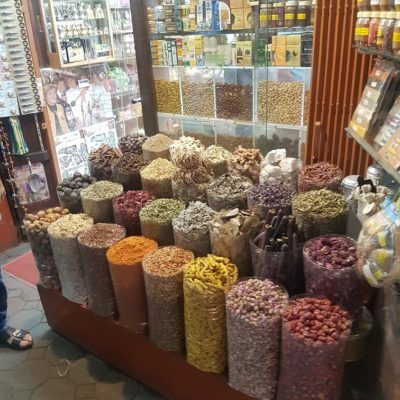 I ended up buying a couple of spices, again haggling with the price. I was really pleased with a photo I got of spices that I got a copy printed for a friend. 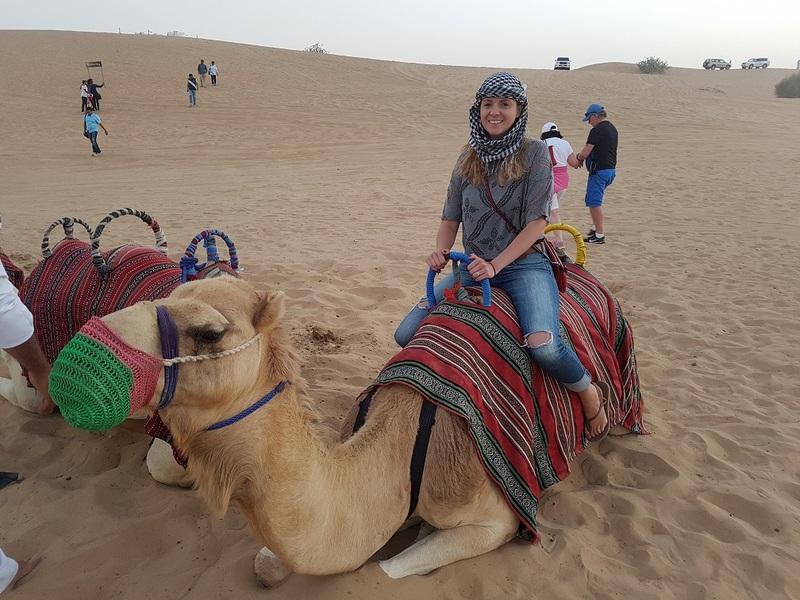 Last but by no means least – take a desert safari! 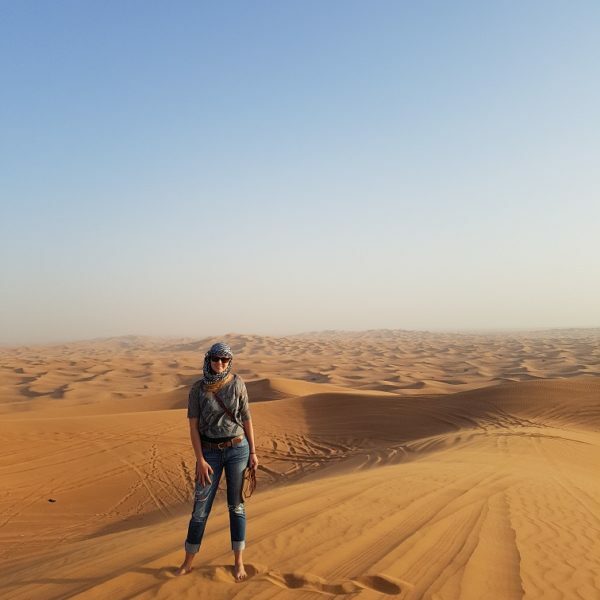 Taking a trip out to the desert was an absolute must for me when visiting Dubai. 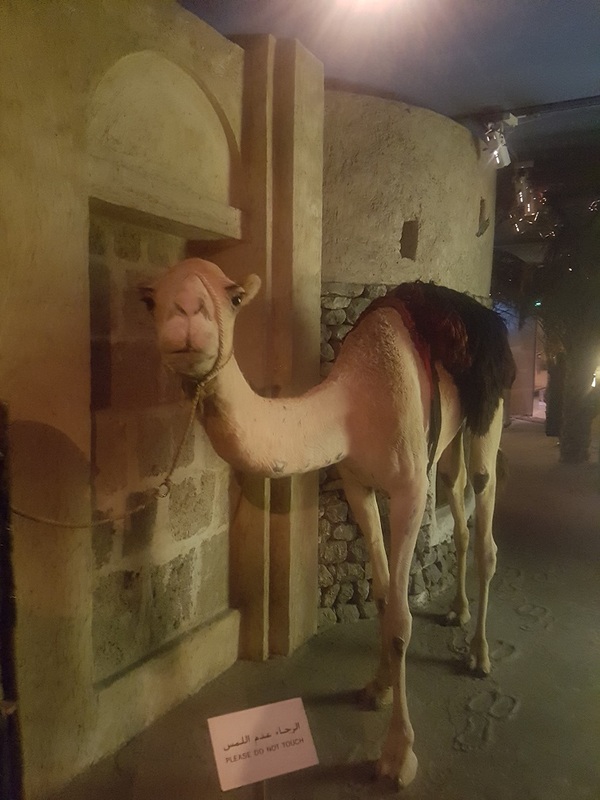 There’s various tour companies and I went with www.bookdubaitrip.com, chose the Evening Safari Tour and booked via WhatsApp. 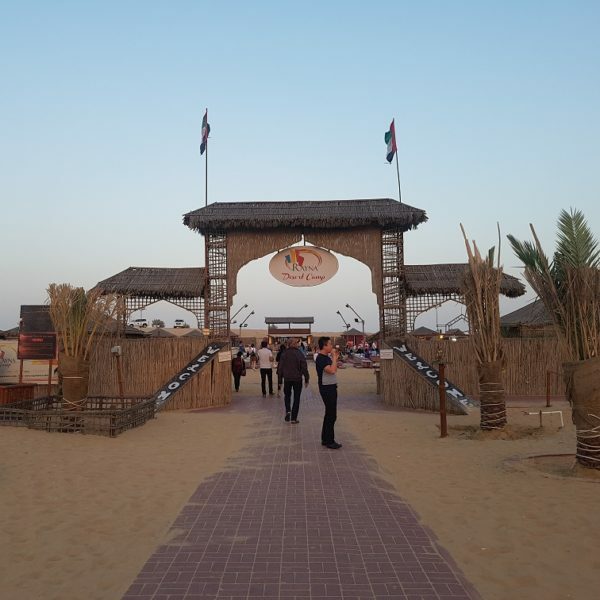 The tour cost AED 150pp and included hotel pick up and drop off, dune bashing, dinner and entertainment. 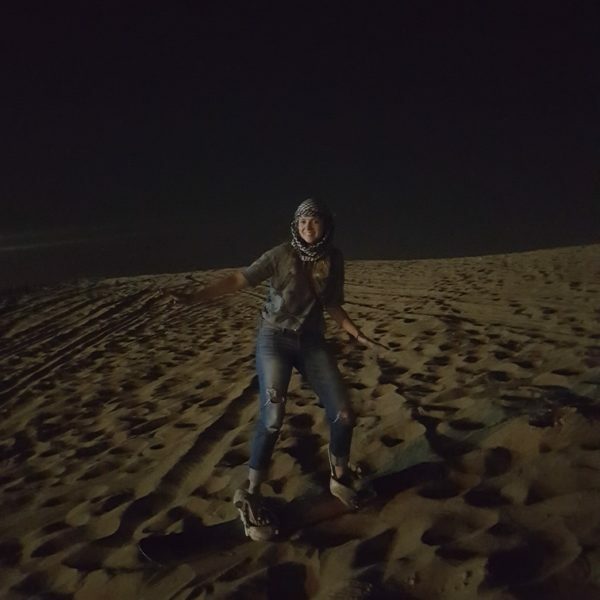 I went on the desert safari with my friend Paul and we were picked up at the hotel at about 3pm in a 4×4, joining the driver and another two people. Our driver drove us to the outskirts of the city where we got out of the car and had some time to kill. 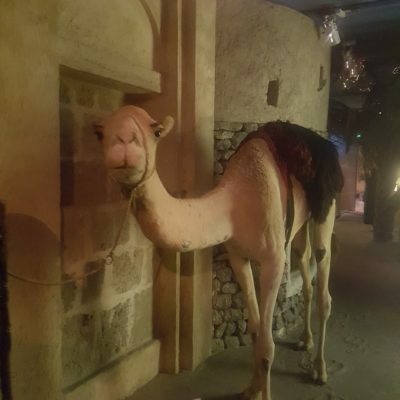 There was a few places to buy food, a couple of camels, a falcon and toilets. 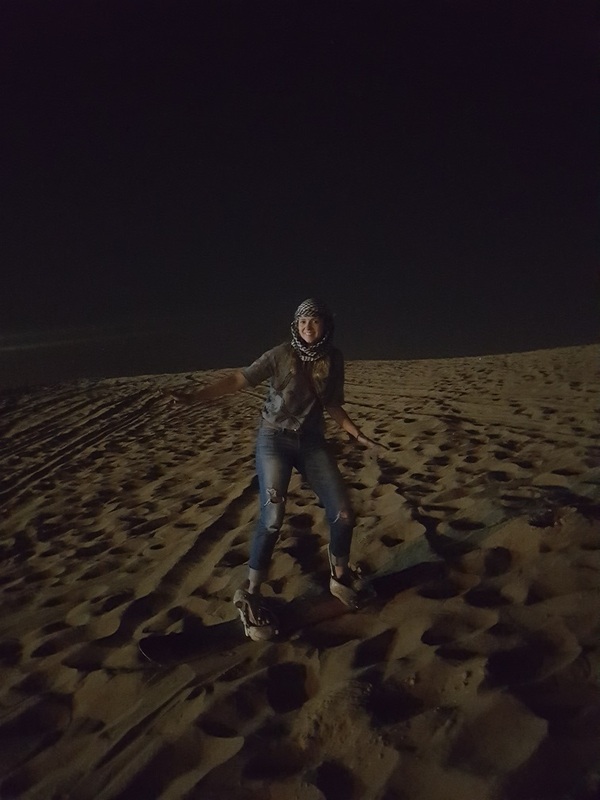 A guy was walking about selling scarfs which I decided to invest in for the full desert experience! I felt really bad for the poor falcon who was tethered to a post with its eyes covered by a hood, except when people paid for photos holding it. After about half an hour of hanging around, our driver called the four of us and we went to a 4×4. The driver let air out of the tyres and we hit the desert for some dune bashing! 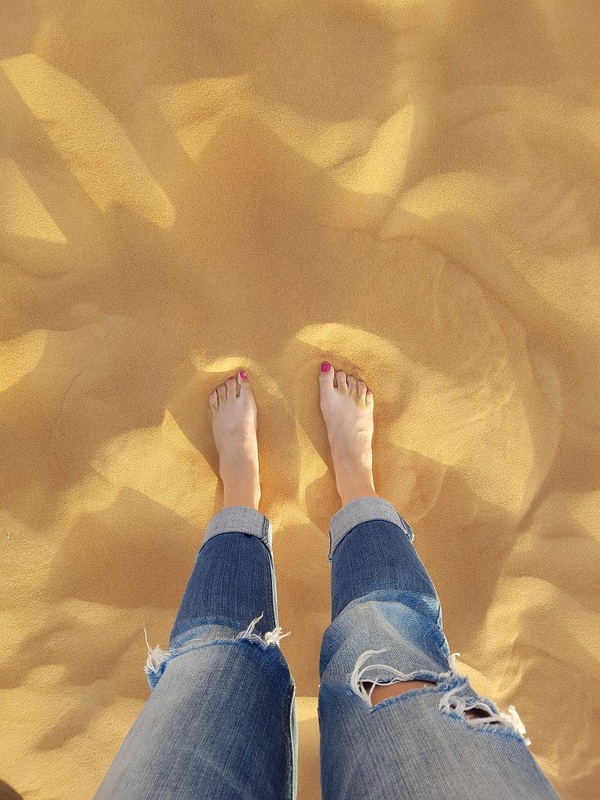 We drove around for a while, up and down the dunes and stopped in the middle of the desert for photos. 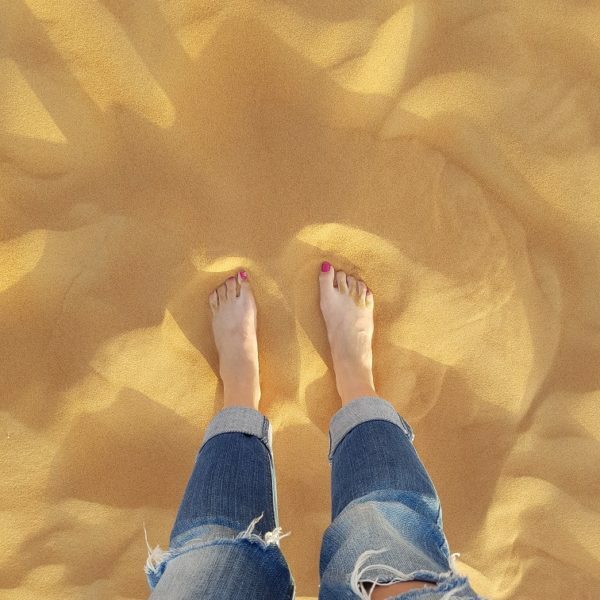 There was sand in every direction, as far as the eye could see. It was beautiful and I was surprised by how much I loved it! 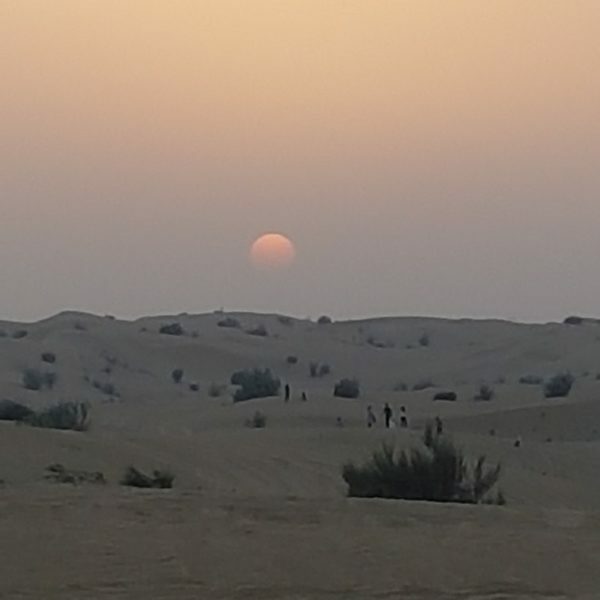 We continued on our drive and arrived at the desert camp. I assume there’s various desert camps, with hundreds of people on desert safaris heading to each one for dinner and entertainment. 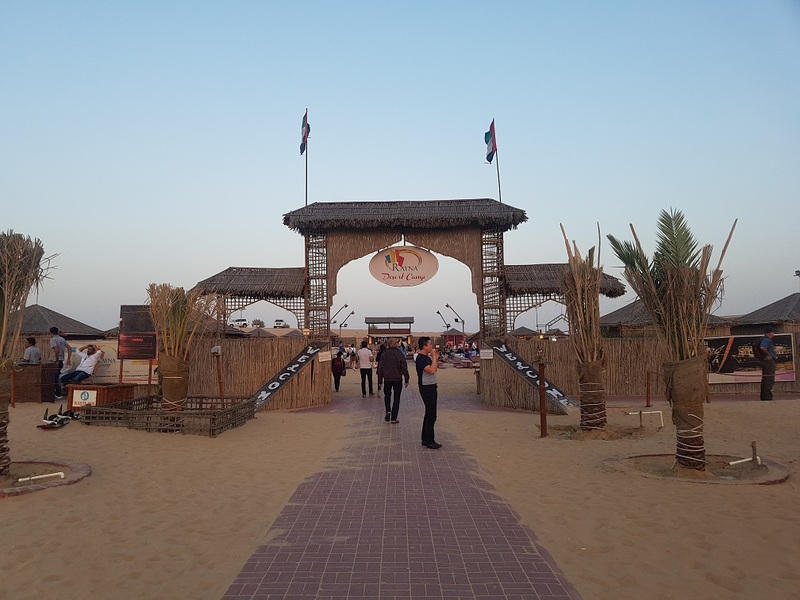 Within the camp, there’s a stage in the centre and activities around the outside – henna painting, Arabic dress and Sheesha. 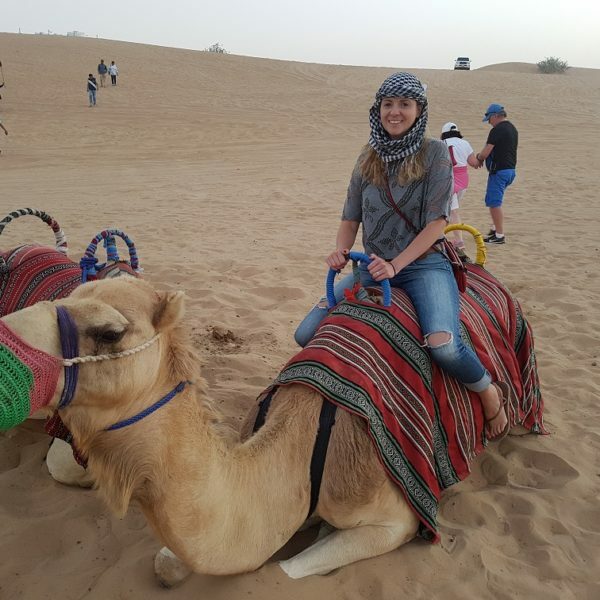 Outside of the camp there’s camel rides and sand boarding. 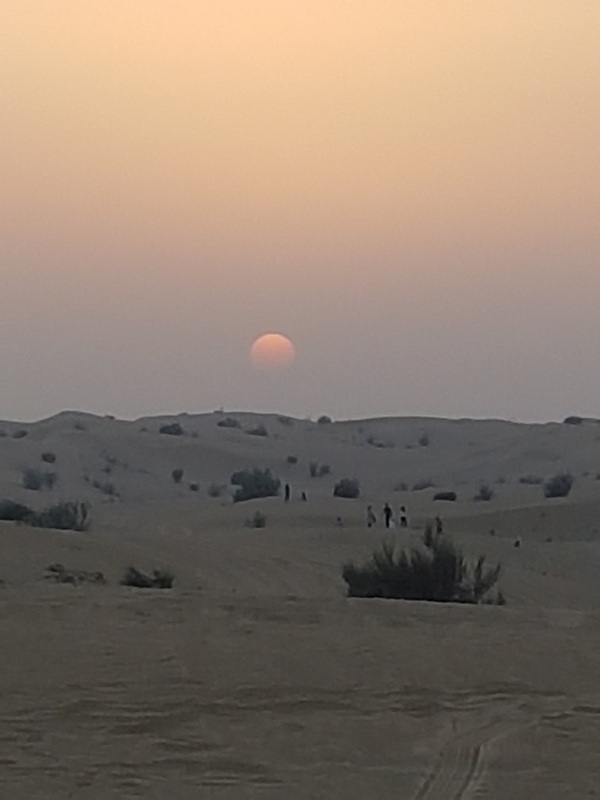 We watched the sunset and had a ride on a camel (which I instantly felt guilty about) before going inside the camp. The centre stage has entertainment of dancing and a fire show which was pretty impressive. Dinner is served buffet style in the camp, with meat and vege options, and soft drinks are included. Our driver rounded us up just before the end, meaning that we avoided getting stuck in 4×4 traffic as the hundreds of people headed back to Dubai. We were dropped off back at our hotel at about 9pm. An amazing last night in Dubai! 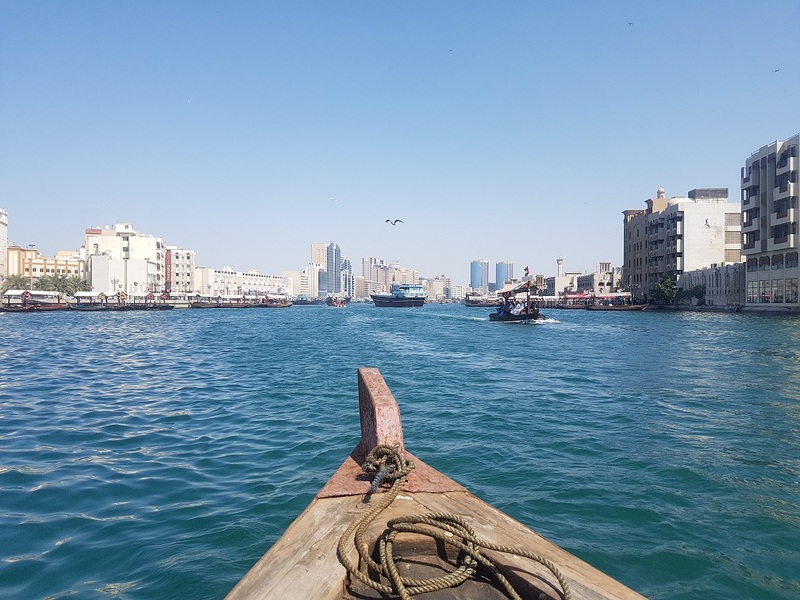 It took me a while to warm to Dubai but after a few days, it really grew on me and I wished that I had more time to explore. 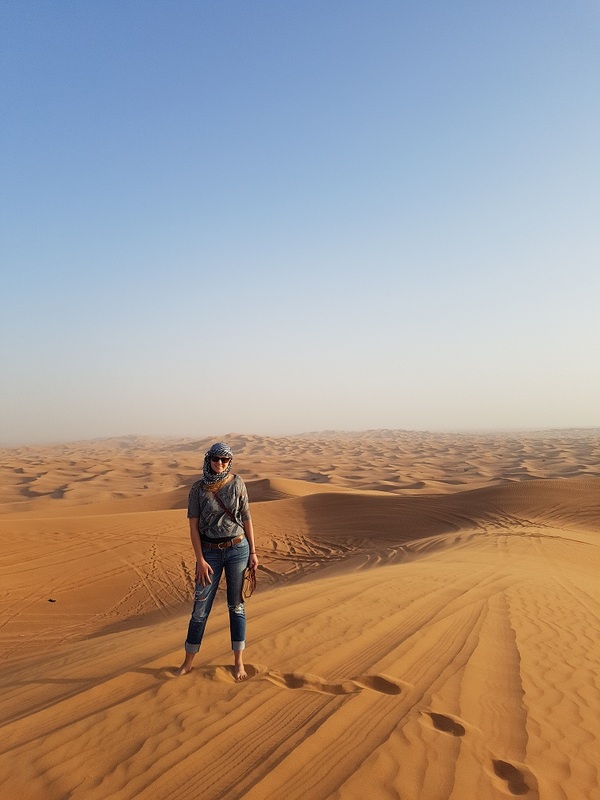 If you’re in Dubai and looking for an alternative to the malls and Burj Khalifa, I highly recommend doing a few things on my list – especially the desert safari and cultural brunch. 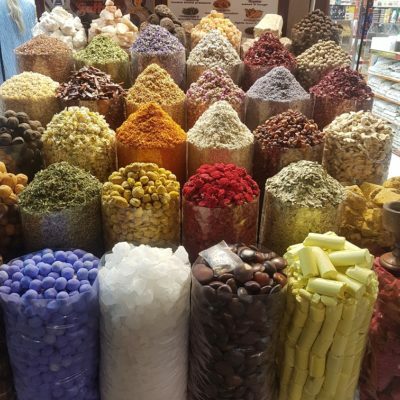 Dubai has a reputation for being really expensive but doing everything on my list (excluding any souk purchases!) 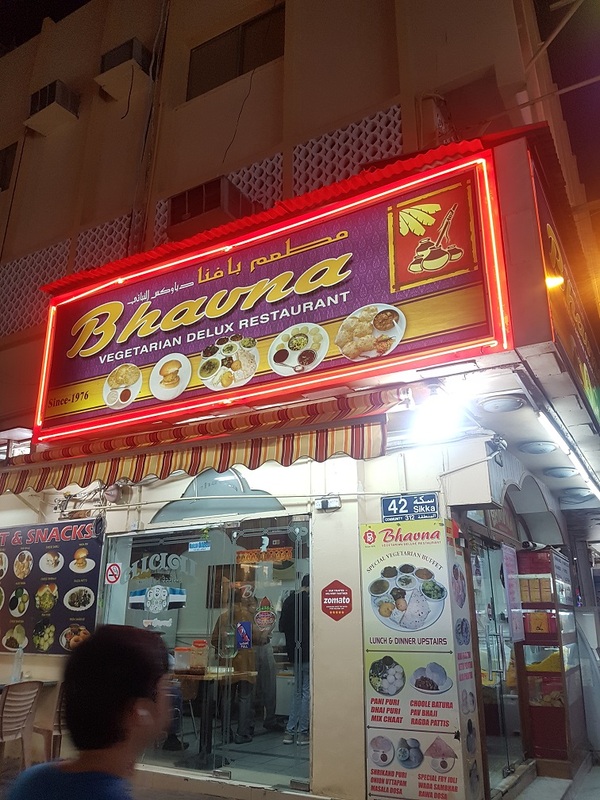 will cost you AED 304 (less than £65). Also, aside from the desert safari, everything is in easy walking distance from each other. 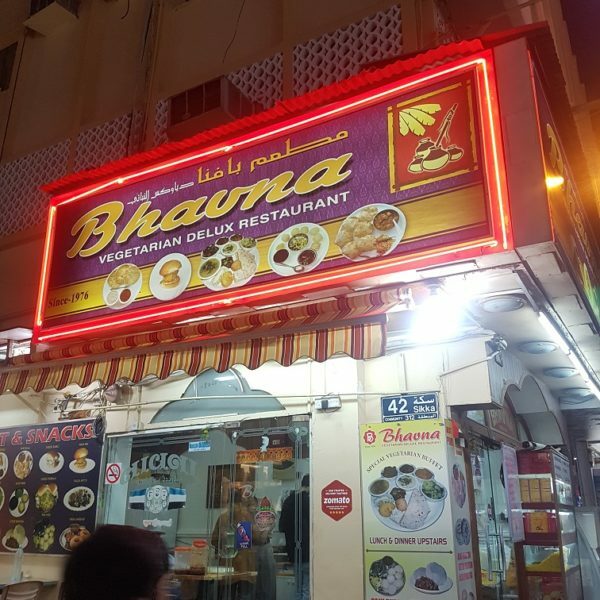 Around the same area (between the Museum and the Textiles Souk) I found restaurants that were really reasonably priced. 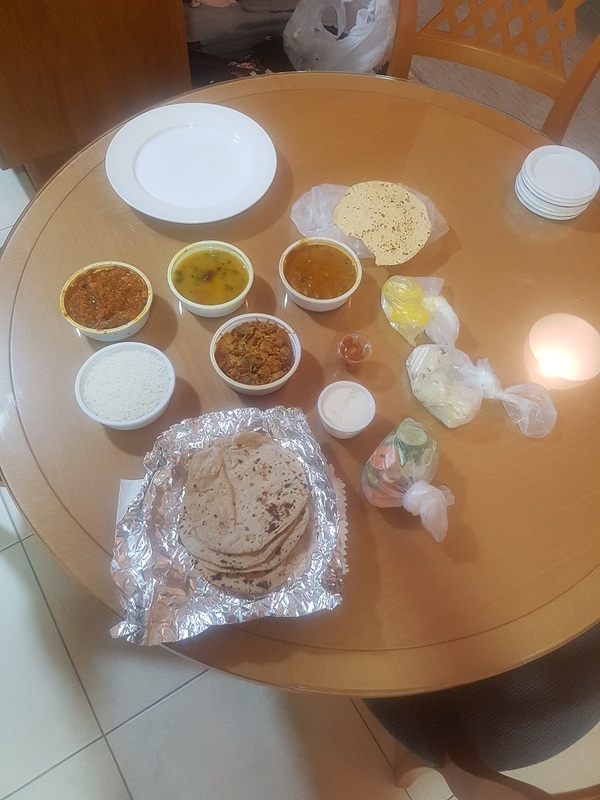 I got a vegetarian Thali set to take back to the hotel that cost about £5. 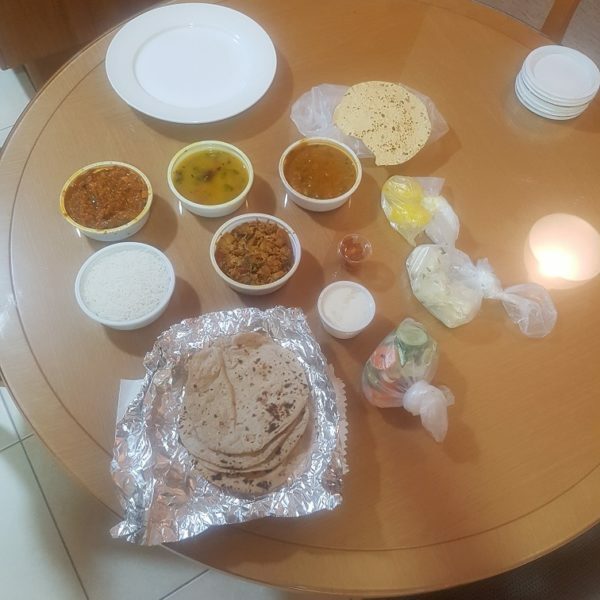 Based on the price, I assumed it was only enough food for one person but it ended up feeding me the next day too! Also, my fab hotel only cost about £55/night. 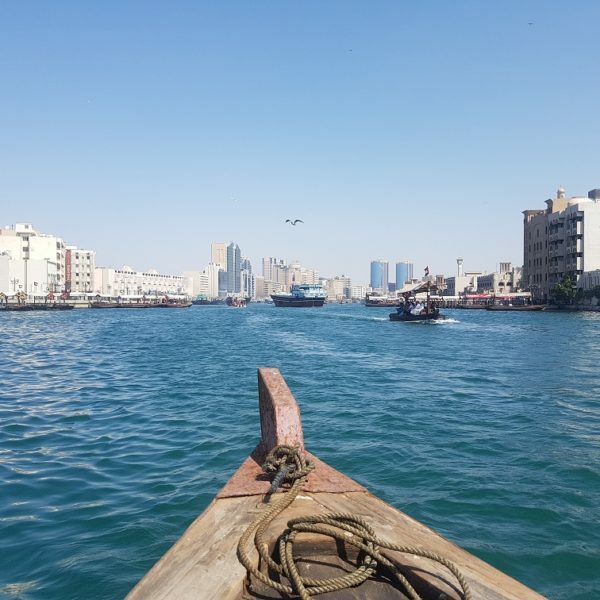 A quick note on travelling around Dubai as a solo female. Overall, I felt really safe all the time when I was walking about on my own. Around the Al Fahidi Metro Station I really felt in the minority as a woman as there were mainly men in the area. Again, I felt perfectly safe and didn’t get any unwanted attention but found it odd. One day I decided to wear shorts but felt uncomfortable so decided to go back to the hotel and change into trousers. I’m sure I would have felt fine wearing shorts in other areas, such as the beaches, but felt that it was more respectful to the culture to cover up a little.